Mind on Movies is very excited to announce that we are working with Universal to giveaway a GET OUT Prize Pack. 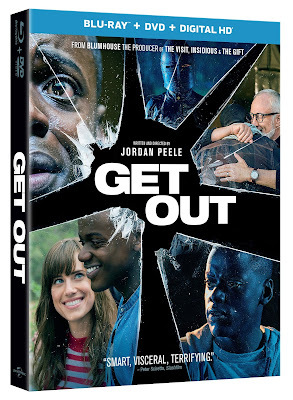 A speculative thriller from Blumhouse Productions (Split, Insidious franchise, The Gift) and the mind of Jordan Peele, the first African-American writer/director to cross $100 million at the box office with his debut film, GET OUT arrives on Digital HD on May 9, 2017 and on Blu-ray™, DVD and On Demand on May 23, 2017 from Universal Pictures Home Entertainment. Known as the best reviewed movie of 2017 on Rotten Tomatoes to date, the dark and unsettling break-out hit is deeply relevant to modern day topics, captivating audiences with thrilling conflicts and danger at every turn. Q&A Discussion with Writer/Director Jordan Peele and the Cast: Director/Writer Jordan Peele sits down with the cast to answer fan questions on the film hosted by Chance the Rapper. GET OUT releases on Bluray and DVD on May 23rd 2017! Share, Follow, and Comment to win! Comment DONE below when completed. Comment on any Movie Review HERE. Subscribe Here to join Mind on Movies Email List. Disclaimer: Only one entry per mailing address per giveaway. The prize will be sent via FedEx or UPS. No P.O. Boxes please. This contest is from Mind on Movies working with Universal. The entries will be checked. You must do what it says on the widget option to enter to win.